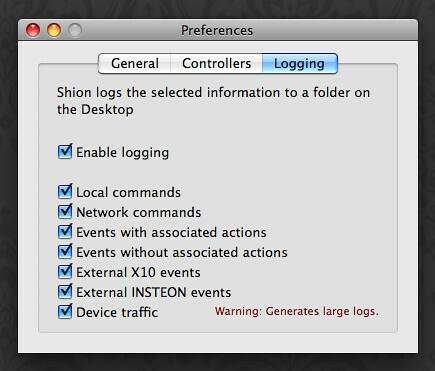 I’m happy to announce that Shion 2.0b5 is available for download. 1. The reliability enhancements should help Shion work better on Smarthome PowerLinc USB V2 (2414) devices. I identified a number of situations that caused the software to hang and these are now being dealt with in the software. I also included a fix that should solve the flickering lights problem. the level of device named "Overhead Light"
deactivate the device named "Overhead Light"
activate the device named "Overhead Light"
activate the snapshot named "Corner On"
Information is logged to a folder on your Desktop called Shion Log in plain text files organized by date. Use any text editor to inspect the files’ contents. Note: The in-application update is currently not working, so you’ll need to download the software directly from the link above. I should have this fixed in the next release.